The Cellfina™ System is an advanced cellulite treatment that treats the dimpling seen on the surface of the skin. 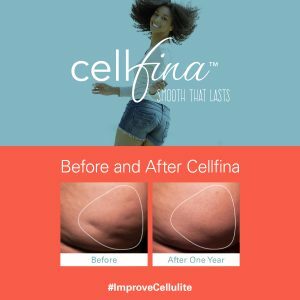 Cellfina is the only FDA cleared, minimally invasive procedure clinically proven to reduce the appearance of cellulite for results that last at least three years – the longest duration cleared by the FDA. The procedure works by treating the connective bands woven throughout the fat, causing them to release and remove the dimpling. The Cellfina™ cellulite treatment is performed by our medical staff and typically takes 45 minutes to an hour to complete depending upon the area of concern. A small suction-stabilizer is used to pull skin tight and stretch the cellulite-causing bands into the optimal position for treatment. The medical professional then delivers a local numbing agent to break up those tight, connective bands that are causing the cellulite. Once the bands are released, the skin appears tighter and smoother for a three year duration or longer. Diet and exercise habits may contribute to lasting results. Results can be seen in as little as three days. Patients in clinical studies showed significant improvement shortly after the treatment, with results lasting at least three years—the longest FDA clearance for a cellulite treatment. The most common side effects reported by patients in clinical studies were soreness, tenderness and bruising which lasted for only short periods of time. In just one 45-minute treatment, Cellfina™, significantly improves the appearance of cellulite on the buttocks and thighs. There is limited downtime associated with Cellfina™. Some patients experience initial soreness and tenderness, but these side effects resolve quickly with time. How much does the Cellfina™ treatment cost? Cellfina pricing will range depending upon area of concern. A personal treatment plan will be provided the day of your consultation for more customized information. The result is a more toned, firmer appearance to your skin. If you have noticed that lumpy bumpy texture on your tummy, thighs, underarms and buttocks, you’re not alone — Ritacca Cosmetic Surgery & Medspa can help. Call us today to schedule your free consultation ay 847-367-8815 or email at info@ritaccalasercenter.com.